Go to the Pics section to view them all. The album should be available via Dischord on May 21. My wife is Leslie Ditto. We are both great admires of Maynard James Keenan and is drive to create. One of his most recent endeavors is the music group Puscifer that he created in 2003. Leslie was given created freedom to create an image that reflects the spirit and mood of Puscifer’s Music . 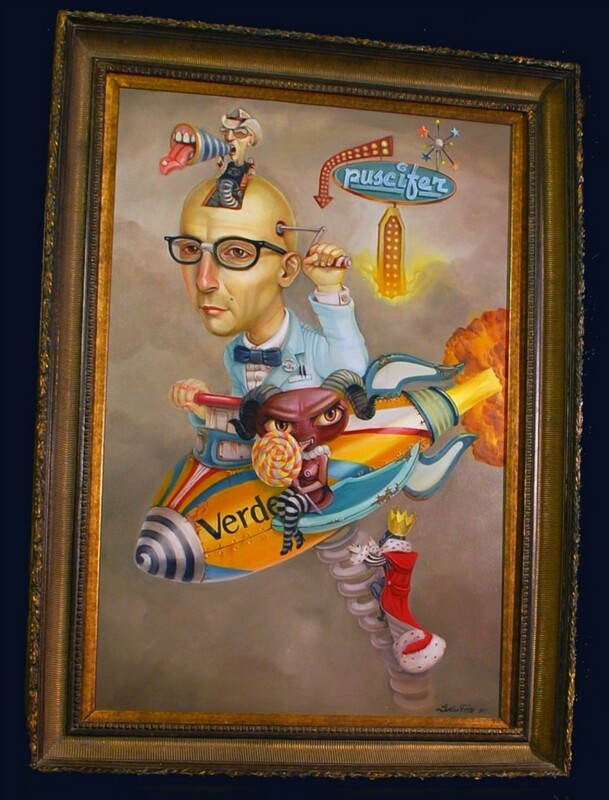 Keeping with Leslie’s stylized imagery that she is recognized for , she composed this piece to playfully symbolize Maynard’s personality and his alter ego in conjunction with Puscifer’s well recognized feminine devilish figure sitting upon the wing of the “Verde ” toy rocket driven by MJK. To create this oil painting Leslie used a techniques from the Dutch Flemish Old Maters . First she painted an under painting in grays using oil paints. Then using oil paints and a personal mixture of medium and linseed oil she applies ,with artistic precision , many layers of transparent color glazes to create this effect. After the painting is complete and dry a Damar varnish was applied. Bidding is currently at US$1025, so clear some room in your wallets! Adam posts a Toolish teaser? 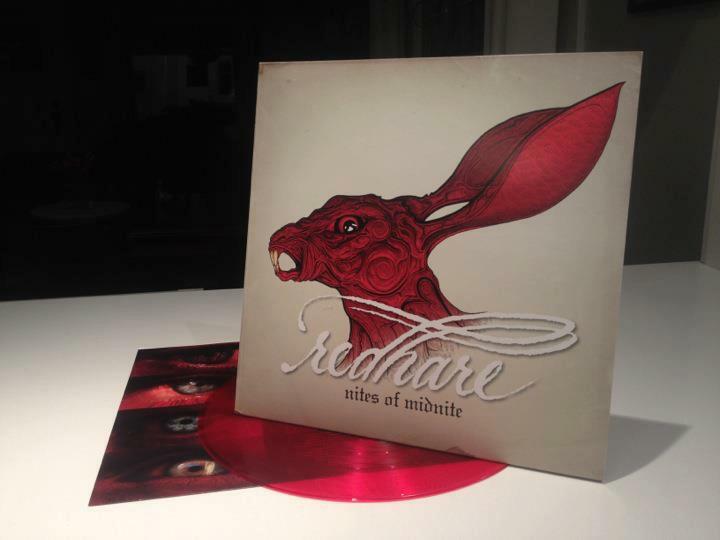 Update: It appears this image is part of the artwork for the new Red Hare album. 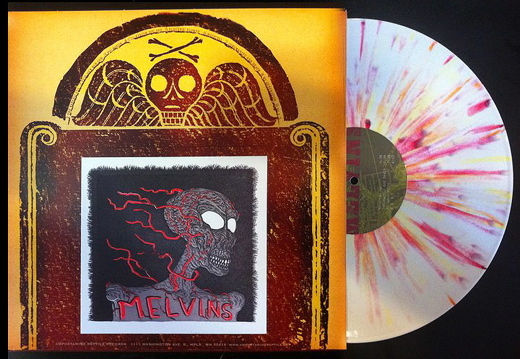 According to Blair, a very limited edition (only 100 copies) of The Melvins latest album The Bride Screamed Murder featuring artwork by Adam will go on sale here sometime tonight. No word on what time it will be, so I expect you guys will spam the site and bring it down soon! Good luck to potential buyers, limit is one per customer, and from memory the albums cost US$50 each plus postage and handling (though I could be wrong). If the Tool story were to be made into a movie, who would be the perfect director for it, other than yourself of course? (Adam) Wow, if it was made for TV, it would probably be Roger Corman. If it was a feature movie, it would probably have to be that German director Rainer Werner Maria Fassbinder, and it’d have to be in German with subtitles [Laughs]. I’m being positive but my life in Tool is exactly like Spinal Tap meets a Shakespearian play. So Spinal Tap meets Hamlet? Exactly, but in a good way [Laughs]. I really love being in Tool. I love what we do and the result of everything. There’s a lot of dysfunction but, at the end of the day, it’s amazing. Worth mentioning is that some of his art will be showing at the Alternative Press exhibition at the Merry Karnowsky Gallery in L.A, which opens on the 9th of July. According to the interview the piece on display will be the sculpture used for the Peach cover. Thanks to Sampson for the tip! An email came out today from Toolarmy (I didn’t seem to get a copy, despite being a member), asking for help in locating some specific pieces of Tool art. If you have any thing listed below in your collection, then please check out the website mentioned and submit it. If you have anything like this, please scan and send the picture of the whole ad to us athttp://www.pure-eng.com/~toolemail/. If you know when and where the ad was posted – that’s even better. Visit Our Website Thanks for your support! Feel free to speculate on what this is really about below! Thanks to funguy for the tip! Update: There is some speculation that this may be a scam. I don’t think it is, but have sent an email to Alan Jones (Adam’s brother, and Tool’s attorney mentioned in the email) for a comment. In the meantime, if you’re especially protective of your email address, don’t submit anything. If you don’t mind, can you tell us more about what happened for this great combination to cease ? Well, I appreciate your interest and concern about that, and I’m sure it’s coming from a good place, but I don’t think there are enough who actually care, to warrant spending much time on it. But I’ll just say in more than 10 years of working together, I contributed as much as I could, and I love Adam like a brother. Working with him was always a meaningful challenge, and I appreciate the experience. But they’re clearly in good hands with the list of super talented artists you mentioned so I don’t assume they have any particular need of me, and I have way more projects of my own than I can possibly manage. There you go. A great interview and well worth reading!